PolitiCraft, Inc. is a 501(c)3 nonprofit formed in 2014, but our story actually starts in early 2013, when the seed for PolitiCraft was planted. Like many ideas, it started as something quite different and evolved dramatically as a result of the work of many talented individuals. I-MPACT LLC, a Louisiana based consulting firm, had explored with a nonprofit organization the possibility of developing a digital social studies game to teach students the basics of government, by working legislation through the various branches of government. While this project did not ultimately move forward, I-MPACT remained convinced that there was a place in the classroom for some mechanism to improve civil discourse and encourage civic engagement among students. No longer focused on a government simulation, the partners at I-MPACT decided to move forward with what had now become a passion project. They knew this was not something they could tackle alone, and went in search of best-in-class partners to develop the vision. After forming partnerships with the National Council for the Social Studies (NCSS) and the National Institute for Civil Discourse (NICD), I-MPACT engaged GameDesk, Inc. in Los Angeles to begin the product development. In December 2014, PolitiCraft, Inc. was incorporated in Louisiana as the entity who would own, fund, develop and distribute the game. Over the course of the next 18 months, and with the invaluable assistance of Mary Ellen Daneels, our NCSS National Teacher Adviser, the idea took on the name PolitiCraft and morphed into the first beta version of the PolitiCraft card game. After internal and student testing, the game got its public introduction at the NCSS National Convention in New Orleans in November, 2015. The reception was beyond our highest expectations, and we set off in early 2016 to ready the initial public version for distribution. Tweaks to the game mechanics based on our testing and NCSS experiences were made, and new original artwork was commissioned. Additional testing followed, and finally in September 2016, the game was locked down and the initial order of card decks was placed. Those decks are now available in our Online Store by clicking here or on the Buy PolitiCraft button in the right column. The mission of PolitiCraft, Inc is to transform traditional civics learning by developing students’ social-emotional skills, literacy skills, systems thinking tools, and design learning mindsets, while fostering improved communication, civil discourse and real-world civic engagement both locally and nationally. Our primary focus today towards achieving this mission is PolitiCraft, a narrative-based ACTION CIVICS card game that guides students through varying levels of civic engagement. Through game play, students are guided by the cards to craft narratives based upon a student selected civic issue, informing them of the multiple pathways available to achieve real change in their school and community, while fostering greater civic participation nationwide. Our aim is to not only empower students with the knowledge of our political system and how it works, but to also give them a safe space to practice what it would mean to engage in bringing about a change in their community. Students who approach problems by thinking through the entire system and then designing new, relevant models are poised to discover innovative solutions. The PolitiCraft platform creates this opportunity at a national level, producing a future generation of driven thinkers with the experience required to successfully address challenges in college, career and civic life. Students have historically felt disconnected from the political process, making it difficult to express their views in a constructive or empathtic way. Providing students with the opportunity to explore real-life civic scenarios is critical and empowers them with an improved sense of political efficacy. The variety of interactions presented by the PolitiCraft card deck cultivate diverse student perspectives, while enhancing socio-emotional, systems thinking, and collaboration skills. PolitiCraft helps students to both understand challenges in today’s society and play through our current system to solve them. While the game is a simulation of the democratic process, our larger goal is to provide an online platform where students can discuss the issues they worked through in the game and develop the knowledge, skills and dispositions of effective civic engagement. A very exciting aspect of our base product is its ability to expand. 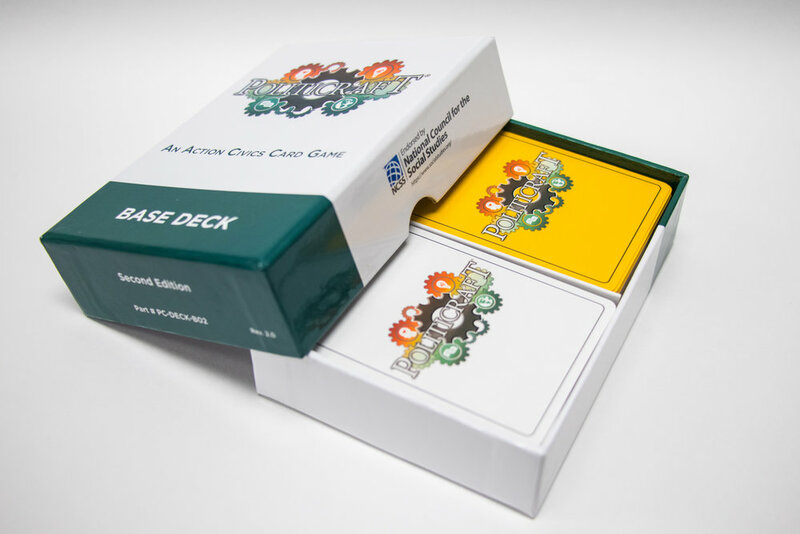 Our “Base Deck” is focused on engaging in basic civic actions while learning how the game works. We plan on releasing relevant expansion packs in the future, utilizing the Trivial Pursuit model. Everything from decks tailored to specific areas of the country, relevant current issues, and other academic subjects such as World History, Geography, or Economic themed decks would be designed to integrate into the base deck, broadening or completely changing the dynamic of game play from one day to the next. The advent of digital printing may soon make it cost effective to even localize cards in the Base Deck to further enhance the relatability of the game to students. On top of staying current with our expansion packs, we are encouraging all teachers and students to share their stories of civic action on social media using #WeDoCivics. Our goal is to build a community where students and teachers can trade ideas and get excited about the opportunity to impact real change. And ultimately, to make civics seems more accessible and ‘cool’. We also see the opportunity to create a version of the game tailored for teachers and administrators, that could be used as a professional development tool in the education setting. Versions developed for leadership training or corporate settings could serve as a funding mechanism to support our mission to make the game accessible to all schools.